Manado. (29/5). Coordinated Patrol (Patkor) between the Philippines and Indonesia (Philindo) to XXVII of 2013 was officially closed by the Commander of the Eastern Fleet Security Force (Guskamlatim) Laksma TNI Wuspo Lukito in ballroom Mako Lantamal VIII. Wednesday (29/5). Attending the ceremony proficiency level Navy officials including military Laksma Danlantamal VIII Manado Guguk Handy, Wadan Lantamal Marine Colonel F. VIII Saud P. Old Tamba, Asintel Danguskamlatim Col (P) The Assistant Danlantamal VIII, Head / Project Implementing Unit Heads Lantamal VIII, grouper KRI-812 Commander Marine Maj. (P) Kusumo Atmojo. While officials of the Government of the Republic of Philippines, Philippine Consulate General Mr. Jose Burgos, Capt. Antonio Antonio Habulan Commander Naval Forces Eastern Mindanao (NFEM), Capt. Severino David Vicente Easmincom PN Deputy Commander, along with the commander of the warship BRP Miguel Malvar PS 19 and PS 20 BRP Magat Salamat. The ceremony was the culmination of a series of activities to Patkor Philindo XXVII of 2013 which has been held for ten days from June 20 - May 29, 2013 in the border area between Indonesia and the Philippines. Previous Patkor Philindo opening ceremony held in the multipurpose room XXVII/13 Mako NFEM by Capt. Severino Vicente T. David, Deputy Commander Eastmincom. In his written speech, Danguskamlatim say that the sea has a very important role in human life, not just as a line of communication but as a trade route, but it also has a marine natural resources potential. In a changing world and regional strategic environment, maritime security is a global and regional issues, so it takes cooperation and other efforts of neighboring countries and the countries around it to ensure the safety of maritime activities. Further, he said, that if the maritime security and stability in the domestic country can be maintained properly it will increase the stability of neighboring countries. Therefore, cooperation between the Indonesian Navy with Philippine navy should be strengthened and Patkor Philindo is one way to make it happen. 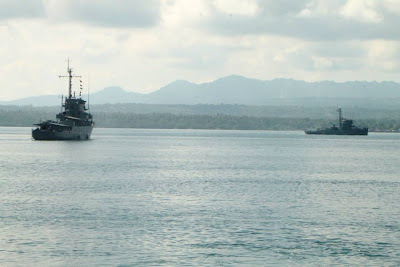 Coordinated patrols in accordance with the Regional Operations Patkor 1975 agreement between the Government of the Republic of Indonesia and the Government of the Republic of Philippines, with the aim is to maintain maritime security in the border of Indonesia and the Philippines. 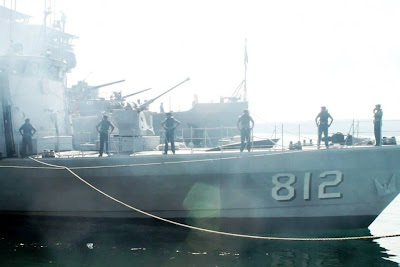 In the implementation Patkor Philindo XXVII of 2013, the Navy deployed warships grouper-812 which is a Patrol Boat Unit (Satrol) Koarmatim and some health personnel from the Navy VIII. While of the Philippines deployed warships NFEM BRP Miguel Malvar PS 19 and PS 20 BRP Magat Salamat. Some of the activities that have been implemented during the last Philindo Patkor include exercises to test the interoperability elements include exercise Patkor combat formations and communication between elements of a warship, social work (Military Civic Action Project) with the goal of both societies in Balut Island (Philippines) and Marore Island ( Indonesia), the repatriation of the three Philippine nationals (WNP) of Indonesia, a courtesy call to state officials of both countries and sports events friendship between the two countries. Patkor training activities conducted by the warship element includes exercise treatment / discharge disandra enemy ships, sailing passed, determining the point of anchorage, Replenishment At Sea (RAS), bhakti pembersama social activities include mass circumcision performed by 86 children, examination and treatment 53 teeth, examination and treatment of 137 common diseases, tumor surgery 2 people, free haircuts 129, division 200 cups pureed green beans and distribution of rice donations consulate 1250 kg to 125 households. Additional activities and social bahkti Military Civic Action Program (MCAP) which is implemented in Balut Island and Island Marore an activity for the first time. This represents an increase of activity in the field of cooperation between the two countries, especially its armed forces. In the Session Level 31 Chairman of the Republic of Indonesia - Republic of the Philippines Border Committee held in Napier on December 20 - 21Pebruari, 2013, both parties have agreed to also do social work during Patkor Philindo implementation and coordination of meetings Patkor Mako Philindo in Eastern Mindanao Command on May 16, 2013. Social Service activities carried out in the district gymnasium P. Dressing, followed by a community coming Balut Island and Sarangani Island which is part of the Philippine territory. Where in the two islands inhabited by Citizen Philippina and Indonesian citizen who had been living there for a long time. Implementation of social service / MCAP has the support of local government officials in Balut Island since the two countries has helped people who were in the island of Balut and Sarangani especially in terms of health. Similarly, the P. Marore which is the outermost islands of the Indonesian territory which borders the country Philippines. The third island community that become the object of charity is seen very enthusiastic MCAP as he expressed his hope that this event can always be implemented going forward. The drugs used in this activity comes from Easmincom, Lantamal VIII and the Consulate General in Manado Davao City, while the contribution of the Consulate General of rice have been distributed in Balut Island and Island Marore. Before ending his speech, hope that implementation Patkor Danguskamlatim Philindo XVII of 2013 was able to achieve the expected goals, among others, as a forum to promote greater understanding between the Indonesian Navy and Philippine Navy, to enhance maritime security in the territorial waters between Indonesia and the Philippines as well as a liaison from the second to the Navy, in consultation and to discuss issues of mutual interest.